I need you to do something for me: DROP EVERYTHING. 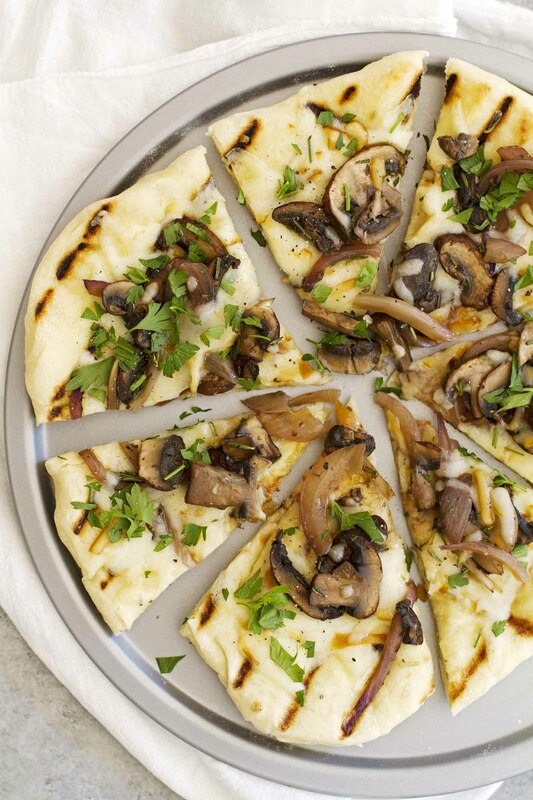 And make this grilled mushroom pizza immediately. OK, maybe that’s too pushy, considering I just had my first sip of coffee and am myself nowhere near the energy level to, like, get off the couch, but in about an hour or two? It’s pizza time. The reason for my haste is this: This pizza is good. But like, really good. Like, really really good. Like, really really really real — it’s just good, OK? And you need to get it into your life as soon as is appropriate for your schedule (which I’m hoping is maybe, definitely, today). First, if you’ve never had a grilled pizza, what are you doing with your life? I kid, I kid. But honestly, grilled pizza is where it’s at. In the summer, there is no other way. 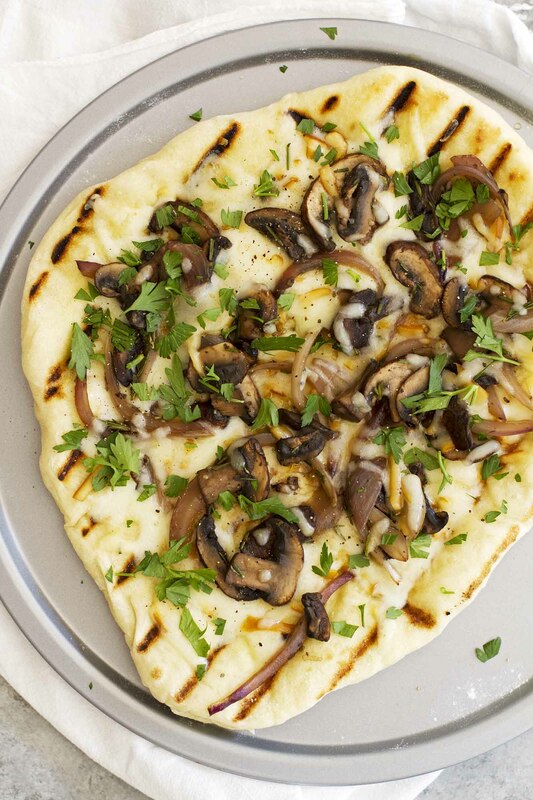 It’s just like making a homemade pizza, but instead of turning on the oven and sweating to death in your kitchen, you can throw it on the grill and not only does it cook much faster, but you get this extra smoky flavor and char from the grill that is imparted into the soft, chewy dough and it. is. just. incredible. I paired that whole situation with a truffle oil/baby bella/fresh rosemary/smoked mozzarella situation so when I told you to get this pizza into your life ASAP? All of that is why. The dough itself is probably the easiest part of the recipe, and it’s also my favorite part (if I had to choose). 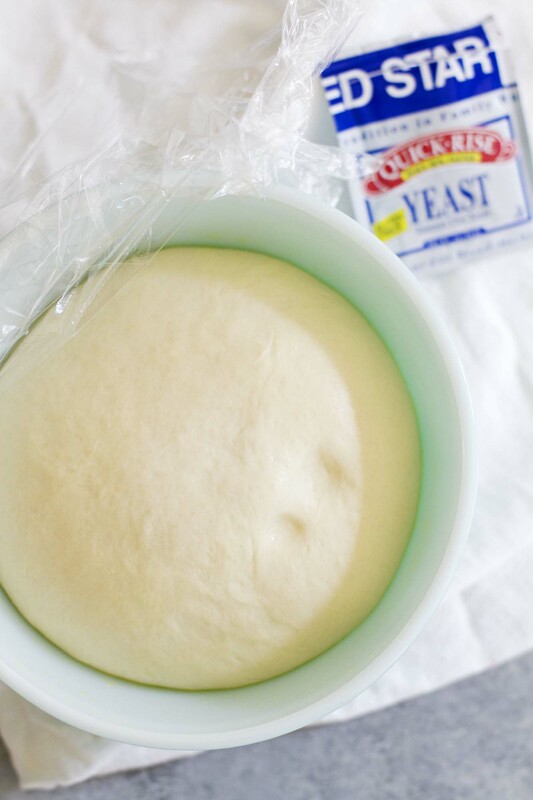 I use Red Star’s quick rise yeast along with a little flour, salt, water and olive oil. That’s it! 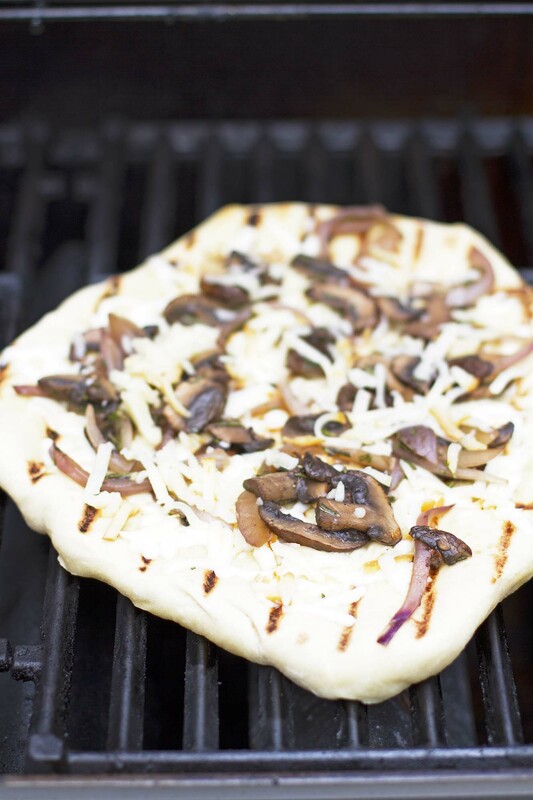 The result is this super soft, chewy and tender dough that lends itself well to the grill. It’s easy to handle and doesn’t toughen up once it hits the heat, but it also holds up many toppings. And I love my toppings, so I load them up. In having grilled a few pizzas in my day, I’ve learned that the best technique is to preheat all the burners of your grill to high heat. Then, after about 10-15 minutes, turn off one side of the grill so you have a direct heat area and an indirect heat area. You’ll start by cooking the pizza dough over direct heat to get that good char on the crust, but when you flip it and add the toppings, you’ll finish cooking it over indirect heat so it can cook through and the cheese can melt before anything starts to burn. It’s a quick process, but you get the hang of it quickly, too. So don’t panic and have fun! And remember, in the end you get a pizza prize. One more sip of coffee and the countdown to pizza time begins. Shape dough into ball. Transfer to lightly oiled bowl; turn once to coat. Cover with plastic wrap and let rise 1 to 1 1/2 hours until doubled. Meanwhile, prepare the toppings: Heat truffle oil in large nonstick skillet over medium-high heat. 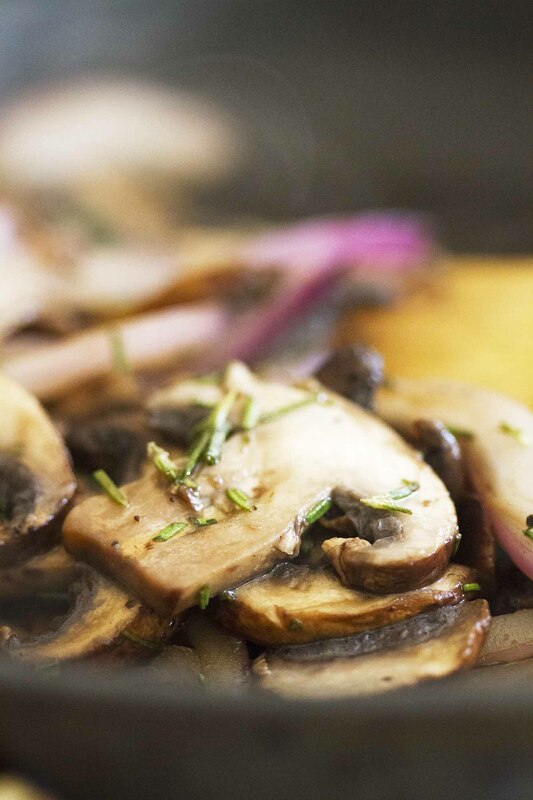 Add mushrooms, onion, rosemary and salt and pepper to taste. Saute 5 to 6 minutes just until mushrooms are softened. Remove from heat. When dough is nearly risen, heat both sides of gas grill on high (500 to 600 degrees F). After 10 minutes, turn off one burner. Punch down dough and divide in half. On lightly floured pizza stone, stretch and roll one piece of dough to 9-inch circle (no worries if it’s not a perfect circle). Brush top of dough lightly with olive oil. Transfer to grill over direct heat, oiled side down. Cover and grill 1 to 3 minutes until bottom of crust is just set and char marks appear. Brush top of dough with more olive oil, then use tongs to flip crust over and transfer to indirect heat. Top crust with half of mushroom mixture and half of shredded cheese. Cover and grill 2 to 3 minutes until crust is cooked through and cheese is melted. Remove pizza from grill. Sprinkle with 1 tablespoon parsley and more pepper. Repeat with second pizza dough. Serve immediately. This pizza sounds fabulous! I love the combination of savory flavors and tastes! An enticing grilling recipe! So much flavor without any meat, especially the smoked mozzarella! Deb — Thank you! I definitely didn’t miss the meat! I am so craving a great grilled pizza! 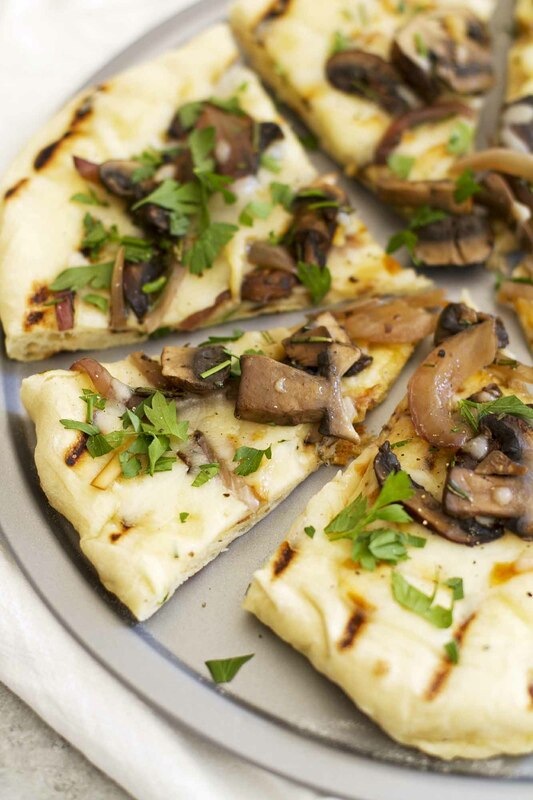 Love this with the smoked mozzarella and rosemary – seriously yum! This pizza looks so lush though! I’ll just have to drool over the idea until I find some smoked mozzarella somewhere! Jasmine — Really any soft cheese like mozzarella will do! Maybe smoked gouda? Thank you for the recipe! Cannot wait to try it out!